Industrial Solutions: Granular activated carbon adsorption is an effective solution for removing Volatile Organic Compounds (VOCs) and trace contaminants from vapor phase applications. Harnessing its versatility, PCC offers Carbon Adsorption Process (PCC-CAP®) systems to treat contaminated industrial vapor streams. Activated carbon utilizes its extremely high surface area to remove contaminants in the process of physical adsorption. At the submicroscopic level, the surface of the carbon pores exerts attractive forces. For certain VOCs, the attractive force of the carbon surface is stronger than the attractive forces keeping them dissolved in the liquid solution or vapor stream. For these compounds, the VOC molecule adheres or sticks or “adsorbs” to the surface of the carbon, thereby removing them from the treated effluent stream. Compounds that are ideal for activated carbon adsorption tend to be organic and non-polar and have high molecular weights and boiling points. PCC-CAP® Adsorbers are also specifically designed to serve as backup devices for Recuperative Thermal Oxidizers (T.O.s), Regenerative Thermal Oxidizers (RTOs), and Catalytic Oxidizers. When your oxidizer requires scheduled maintenance or shutdown, switch over to the PCC-CAP® Adsorber to maximize your production uptime and ensure seamless operation. Activated Carbon Adsorbers can be used for a wide variety of vapor phase applications in vapor emission control, industrial odor control, and other markets. Carbon Adsorbers are designed for use with both continuous and intermittent industrial waste streams, with high flow and low VOC concentrations. 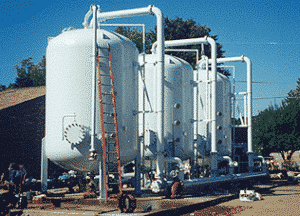 These include process vents, tank filling, and tank vents. PCC-CAP® Adsorbers can receive flows from 20 to >20,000 cfm. Flows > 20,000 cfm are treated by using adsorbers in parallel. The rising emphasis on cleaner air poses new challenges for industry to treat contaminants at air emission sources. 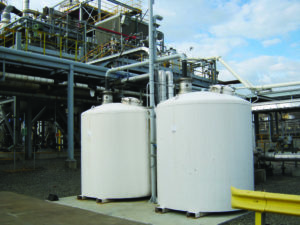 Activated carbon adsorbers are utilized to capture VOCs and other toxic air pollutants from petrochemical plants, landfill sites, manufacturing operations, and chemical processing facilities. There are many industrial processes where odor removal is the primary reason for air treatment. These odors are generally in the vapor phase and tend to contain sulfur compounds such as HS and other odorous compounds. Activated carbon is an effective adsorbent media for odor removal from vapor phase streams. PCC-CAP® Adsorbers are excellent at capturing the odor-causing compounds in industrial applications. PCC offers a wide range of activated carbon adsorption equipment and systems for vapor phase applications in vapor emission control, industrial odor control, Thermal Oxidizer back-up, and other markets. These vapor phase activated carbon adsorbers are designed for the use with: VOC Abatement, storage tank emissions, tank filling, railcar or barge loading, tank vents, process vents and continuous industrial waste streams. The range of flows treated by PCC's vapor phase activated carbon adsorber line is from 20 to >20,000 cfm. Larger flows have been treated by using adsorbers in parallel. All PCC-CAP® Adsorbers are modular and designed to have low-pressure drop, excellent flow distribution, and resistance to corrosive compounds. Customized ASME Code designs are available. Activated carbon is a porous material that removes organic compounds from liquids and gases in a process known as “Adsorption.” The extremely high surface area of activated carbon gives it the attractive, adsorptive properties to remove volatile organic compounds (or VOCs) from vapor or liquid streams. Activated carbon is produced by thermally decomposing organic or carbonaceous source materials – such as wood, coal, or coconut shells – in a controlled environment. The finished product has an extremely high surface area and can be processed further into specific shapes or mesh sizes (e.g. pellets or granules at a 12 mesh size). Activated carbon can also be impregnated with additional adsorbates to enhance the adsorption of specific VOCs and organic compounds. Adsorbers are vessels or modules that contain activated carbon for the purpose of removing contaminants from a process stream. 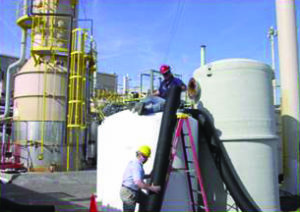 Activated carbon adsorbers are effective in industrial applications, such as vapor emission control and odor removal. Within the adsorber, the waste stream is injected into the vessel with an excellent flow distribution and a minimized pressure drop. Within the carbon bed, VOCs, such as benzene or trichloroethylene, are captured and absorbed into the pores of the activated carbon. Finally, the treated effluent stream exits the adsorber, achieving environmental compliance and reduced emissions. PCC’s Carbon Adsorption Process (PCC-CAP™) Adsorbers are of a modular design and can handle a range of vapor flows from 20 to >20,000 cfm. Larger flows have been treated by using adsorbers in parallel. All of these adsorbers have been designed to have a low-pressure drop, excellent flow distribution, and resistance to corrosive compounds. Customized ASME Code designs are available. What are Suitable Applications for Carbon Adsorption? Activated Carbon Adsorption can be used for a wide variety of vapor phase applications in emission control, industrial odor control, Thermal Oxidizer back-up, and other various markets. They are ideal for Pharmaceutical Facilities, Specialty Chemical Manufacturing, Crude and Natural Gas Refineries, Paint & Coating Manufacturers, and Plastic Resin & Synthetic Fiber manufacturing. PCC offers a wide range of activated carbon adsorption equipment and systems for use with: air stripper off-gas, storage tank emissions, railcar or barge loading tank vents, reactor vents and continuous industrial waste streams. Activated carbon achieves high removal efficiencies for a large number of VOCs until it has reached its usable lifespan and breakthrough occurs. During breakthrough, the activated carbon can no longer adsorb organics, and the spent carbon must be removed and replenished with fresh carbon. Once the carbon’s adsorption capacity has been reached, the spent carbon must be removed from the adsorber and re-filled with fresh carbon. The spent carbon can either be disposed of or reactivated. Reactivation allows for recycling and reuse of the spent carbon. PCC can assist in the disposal, reactivation, and recycling of the spent carbon. Adsorbers may be rented for during the maintenance of thermal oxidizers. This allows manufacturing plants to keep running when the shutdown would have been otherwise required. If rental units are needed, please contact PCC. Please include the compounds and concentrations of the waste stream and date at which the rental is required. Technologies to treat waste streams from Basic Chemicals (organic and inorganic chemicals, plastic resins, dyes, and pigments), Specialty Chemicals (adhesives and sealants, water treatment chemicals, plastic additives, catalysts and coatings) and the Agriculture Chemical manufacturing process. Treatment of waste streams from chemical products derived from petroleum. Specializing in Acrylonitrile and Acrylic Acid processes by using multi-staged technology which results in exceptionally low NOx levels. "PCC... The best-kept secret in the industry." "PCC works like a well-oiled machine." "We would not be where we are today without the engineering knowledge and efforts, quality of construction, professionalism, and cooperation of your first-class organization." "PCC's commitment to safety and quality allow completion ahead of schedule, under budget, and safely." — Toray Carbon Fibers America, Inc.
"PCC's desire to deliver a quality product was apparent throughout all phases of our project, and PCC's overall gas combustion experience resulted in a robust and reliable operating unit." "We are very pleased that it was commissioned five weeks earlier than the contract completion date." 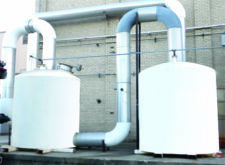 "PCC was absolutely on time with delivery of our thermal oxidizer... I was quite impressed. All the units we bought from PCC run flawlessly, even after 10 years. We can't calculate a MTBF, because there have been no failures."